Looking for an impressive vegetarian recipe for your next dinner party ? 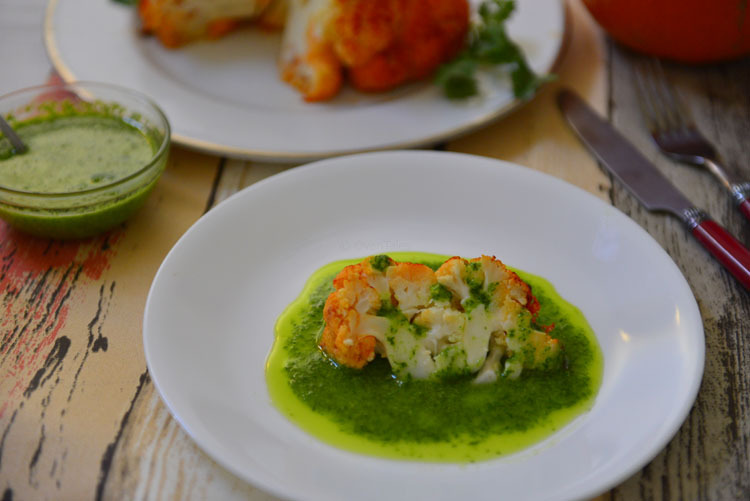 Try this – Roasted Whole Cauliflower With Cilantro Sauce, you wont believe how easy it is until you try ! 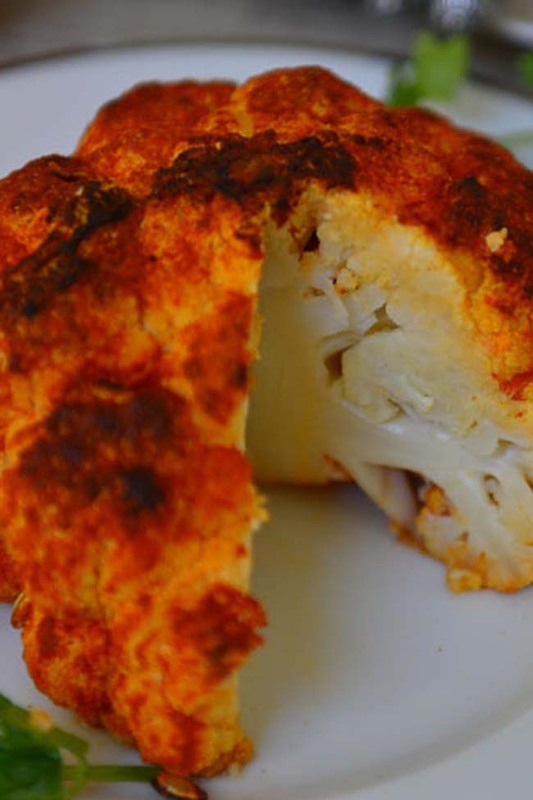 The cauliflower covered in a tandoori inspired marinade and roasted in a hot oven. Once cooked it is fork tender all the way through with a nice crust on top. As it cooks the flavors infuse the florets so not only does it look pretty but tastes delicious as well. The fresh flavors of the cilantro chutney adds a nice contrast . Delish ! Few years back I was chatting with a friend about vegetarian thanksgiving menu. We both agreed that the whole head of roasted cauliflower looked very pretty , but were not excited about the flavors. Once you cut into the cauliflower the insides look bland and not exciting. It is fine if you are a fan of steamed cauliflower, but out here we like things a little more flavorful. I definitely wanted to spice it up a bit, but – and that is a big BUT – still wanted to do it in a short time. The first thing that came to mind was a sauce – this dish needs a sauce. 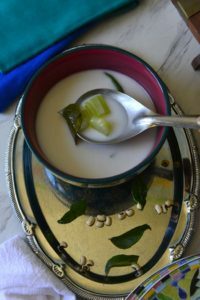 The cilantro chutney picks up on the flavors used in marinade and creates a beautiful contrast of flavors and colors. Just a dab of it and you go from ‘blah’ to ‘yeah’ ! Did I say that this was an easy dish to make ? Well it is – all you do is mix the marinade , rub all over the cauliflower and roast . 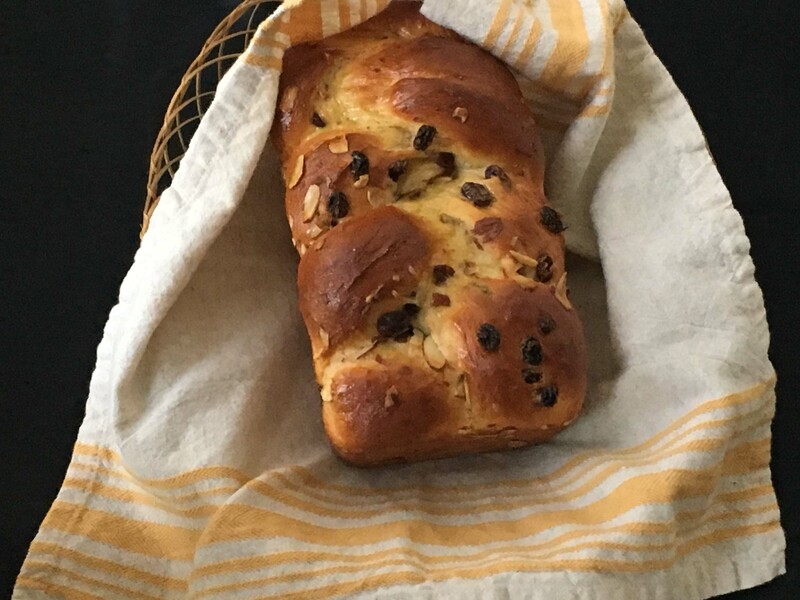 No waiting , no stirring , no lengthy prep. And for the chutney, just pulse all the ingredients together in the blender! 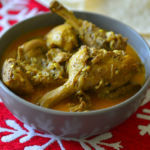 If you are pressed for time, you are going to love this – both the chutney and the marinade can be made a day in advance. 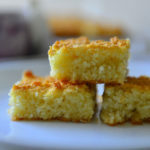 Do not marinate the cauliflower for long periods though. The moisture and acidity tends to break down the florets. The marinade used here is inspired by the tandoori flavors- yogurt , paprika , garlic , salt, cumin, oil and lemon juice. Jut rub it well all around making sure that it gets into all the the nooks and crannies of the cauliflower. When you cut into this you want to see the beautiful paprika slowly seeping into the core. A pastry brush is helpful here. It gently coxes the marinade into the tiny gaps without breaking off the florets. Obviously we do not want the steamed cauliflower – so it is important that the it gets roasted in a fairly hot oven 400°F or 425°F should suffice. You don’t need any fancy equipment either. 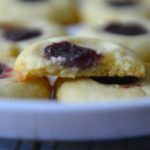 Just roast it in a pan that will catch the juices – in other words don’t use a cookie sheet. Here I have used a porcelain casserole, but you can use any oven safe, non reactive cookware ( the marinade is acidic). A skillet, cake pan, clay baker , dutch oven or anything that is big enough to hold the cauliflower will get the job done. The other thing to remember is to trim the stem so that the cauliflower stays in the pan firmly. Remove the leaves and trim the stem. Do not remove the stem to the core as we want to keep the head intact. Mix all the ingredients for the marinade. Turn the cauliflower upside down and brush the marinade. Let it sit for 1 minute. Lightly coat the roasting pan with oil and place the cauliflower right side up in the pan. Slowly pour the marinade on top. Use a pastry brush to get the marinade into all the nooks and crannies. We are looking for a nice thick coating , so don’t be afraid to slather it on. Place the lid on or cover with aluminium foil. Now it is ready for the oven. Place the oven rack a little below the center and transfer the cauliflower to the pre-heated oven. Cook covered for about 30 minutes. By this time the cauliflower would have given off some juices. 30 minutes should suffice for a medium head of cauliflower, for larger ones add an extra 10 minutes. All that is left now is to brown the tops a little. If you have the broil option broil for about 10 minutes, keeping an eye on it after the 5 minute mark. Or turn the oven temperature to the maximum and bake for another 10 minutes. I burnt the tops a little – but you can do better. Take it out of the oven let it rest for few minutes. Transfer to the serving plate. If there are pan juices drain and strain it. Taste and adjust seasoning (a dash of lemon or salt) and drizzle over the cauliflower while serving. Or you can do what I did I did here, brighten up the flavors with the cilantro chutney. I prefer the cilantro chutney as it is a nice contrast of flavors and colors. Before I forget, if you want a vegan version substitute equal amounts of vegan yogurt, coconut cream or almond milk for yogurt in the marinade. 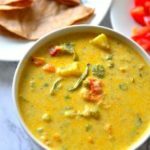 This is an impressive looking vegetarian dish that is easy to make. 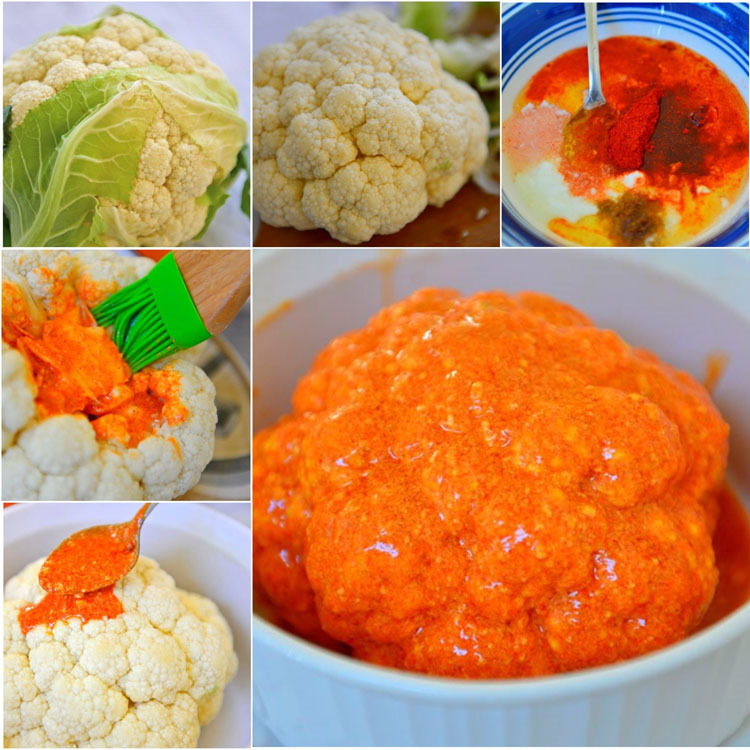 Whole head of cauliflower is coated with a flavorful marinade and roasted in high heat. Pre-heat the oven to 400° F.
Mix all the ingredients for the marinate well. Taste , it should be a little salty, and adjust spices if needed. Remove the leaves of the cauliflower and trim the stem in level with the florets. Wash and pat dry. Invert the flower and brush the marinate on the bottom. Let it rest for a minute. lightly coat the baking dish with oil and place the cauliflower in it. Slowly pour the marinade on top. Use a pastry brush to push the marinade int the crevices. Tightly cover the dish with a lid or foil and bake for 30 minutes. Uncover and broil for 10 minutes or till the tops brown lightly. Remove from the oven and let rest for a few minutes. Transfer to a serving plate. Remove the thick stems from the cilantro and reserve the leaves. Squeeze the lemon and set aside about 2 Tbsp of juice. Add cilantro , olive oil , garlic and green chili to a food processor or blender and process till smooth. Add salt and half the lemon juice. Pulse once and adjust salt and lemon juice per taste. Slice the cauliflower and serve drizzled with the cilantro sauce. If you don't like cilantro substitute green onions (scallions), mint or parsley . 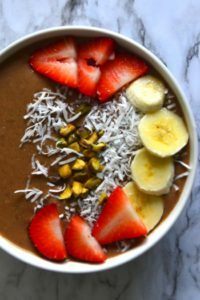 For vegan version substitute 1/4 C yogurt with 2 Tbsp coconut cream and 1 Tsp lemon juice. Thin the marinade with 1 to 2 Tbsp of water, as needed. This looks absolutely amazing! I know my vegan friends are going to love it. I am sure they will. 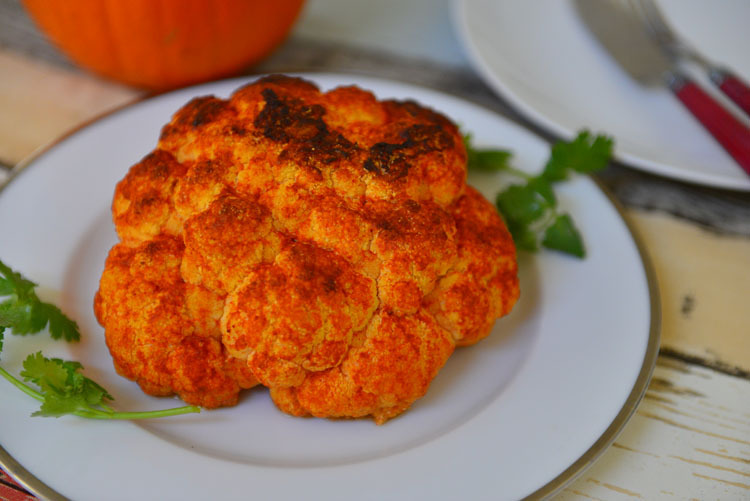 cauliflower is my fav among veggies and loved the idea of roasting! plus chutney is yumm. 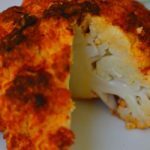 I love roasting a whole cauliflower – there is just so much that you can do with it in terms of flavourings. So true , and it looks pretty with so little effort ! Yes, cauliflower has never been my favorite veggie for the exact reason you describe. I like your approach! I can’t believe I haven’t tried roasting cauliflower yet! I would definitely love this version!